At the 2015 IPCPR Trade Show, Davidoff will officially launch the Davidoff Escurio. The Escurio continues the company’s theme of innovation – an initiative that has been seen in action prominently ever since Hans-Kristian Hoejsgaard became Davidoff’s CEO back in 2011. With the Escurio, it is a blend that is heavily influenced by Brazilian tobacco – something that hasn’t really been seen in a Davidoff branded cigar. The name Escurio is a derivative of two words – Escuro (which means dark – and in this case the cigar’s wrapper falls into this category) and Rio (short for the Brazilian city of Rio de Janeiro – which was an inspiration for this cigar). Recently I’ve had an opportunity to smoke the Davidoff Escurio in the Robusto format. Davidoff has been a roll for the past couple of years – and the momentum continues with the Escurio as this cigar delivers another home run. The Davidoff Escurio is the second cigar to receive the “Davidoff Black Band”. The first cigar was the Davidoff Nicaragua – the first Davidoff branded Nicaraguan puro. While both have a theme around a particular country – and both have the black band, that is where the similarities stop. The tobaccos of this cigar take over and the Escurio is very much its own creature. The cigar is not a Brazilian puro, but contains a good amount of Brazilian tobacco in the blend. The wrapper of the Davidoff Escurio is described as “dark” Habano Ecuador. The Robusto Tubo and Gran Toro sizes will come in 12 count boxes. The Short Coronas will come in 14 count boxes. There also will be four cigar packs for each size. Note: The Robusto used for this assessment was not sent in the tubo packaging. The Habano Ecuador wrapper definitely falls into the category of “escuro” (i.e. dark). I’d categorize it as a combination of dark milk chocolate with a dark shade of colorado red. The surface of the wrapper is smooth and somewhat oily. There are some thin visible veins and thin visible wrapper seams. The cigar is well-packed – I’d categorize it as firm, but not overly tight. 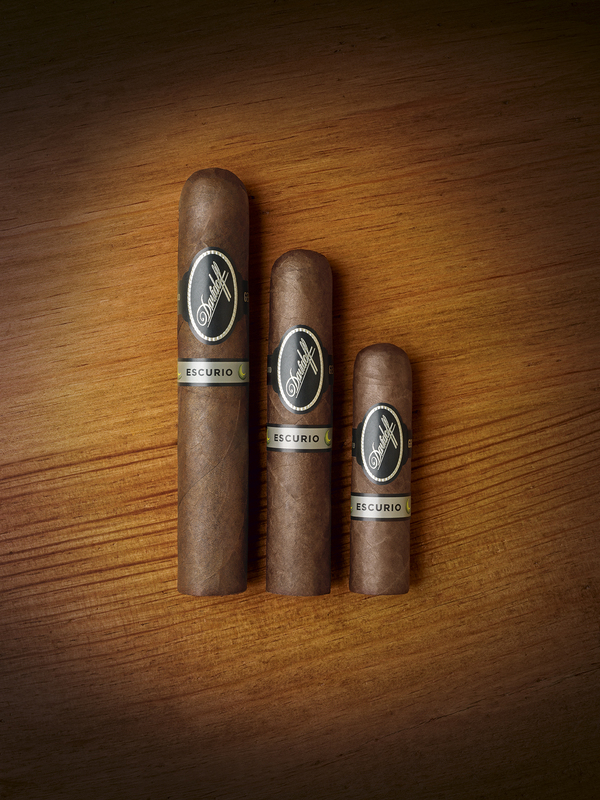 The Davidoff Escurio uses the same band design as the rest of the Davidoff Nicaragua line. This is a black and silver colored version of the Davidoff White Label design. The background is black with the font text and surrounding trim in silver. The Davidoff scripted logo is on the front. To the left of the logo is the text “ROBUSTO”. (Note: each of the vitolas have text with the vitola name in this location). To the right is the text “GENÉVE” (on all of the vitolas). There is a secondary band just below the primary black and silver Davidoff Nicaragua band. It is silver colored with black font and black trim. On the band it says “ESCURIO” in black font. To the left and right is green crescent moon image. As I normally do, I went with a straight cut to remove the cap of the Davidoff Escurio Robusto. Once the cap was removed, I proceeded with the pre-light draw. The dry draw provided notes of cocoa, natural tobacco, and a little bit of citric spice. Overall I considered this to be an excellent pre-light draw. At this point I was ready to light up the Davidoff Escurio and see what the smoking experience would have in store. Right out of the gate, I got a combination of cocoa, earth, some exotic spice, and a subtle citrus note. I found the cocoa and earth notes were primary early on. The exotic spice was secondary and the citric note floated in and out of the forefront. Meanwhile, I also got some spice on the retro-hale, but it was more of a black pepper note. During the second third, I found the cocoa and earth combination remained primary. I also detected some classic Davidoff grassy notes in the background. Meanwhile, the citrus notes were now more grounded as a secondary flavor – along with the exotic spice. Later in the second third, I found the spice transition to more of a red pepper variety and increase in intensity. Toward the last third, I found the red pepper spices took over and became the primary note. While the last stages were spicy, the spices never assaulted the palate. There still were plenty of nuances of cocoa, earth, citrus, and grass. This is the way the cigar experience closed. The resulting nub was firm to the touch and cool in temperature. I found the Davidoff Escurio Robusto to be a well-made cigar and this was reflected nicely on the burn and draw. From start to finish, the Escurio Robusto maintained a straight burn path. There was some minor jaggedness on the burn line itself, but in most cases this really didn’t even require a touch-up. The resulting ash was not overly firm, but it was not loose or flakey. The ash itself had a nice salt and pepper color to it. The burn rate and burn temperature were both ideal. I found the draw to be ideal. The Davidoff Escurio Robusto had a touch of resistance – which is something I like. This was an enjoyable and low maintenance cigar to puff on from start to finish. In terms of strength, I did not find the Escurio Robusto to be a power-bomb. I found it to have a sweet-spot right in the center of the strength spectrum – pretty much delivering a constant level of medium strength from start to finish. As for the body, I found there was some nice depth. The flavors weighted enough on my palate for this cigar to be considered a medium to full-bodied smoke from start to finish. When looking at strength versus body, I gave the edge to the body throughout the smoking experience. The combination of the dark wrapper and the banding makes the Davidoff Escurio one very good looking cigar. On top of that, this is a cigar that tastes as good as it looks. Not only is this unlike any other Davidoff I have had before, but its unlike any Brazilian tobacco-centric cigar I’ve had before. This isn’t a case of revolutionary flavors or super-high complexity. It’s simply a case of flavors working together in a beautiful harmony and firing on all cylinders. On top of that, I really think this cigar has some serious aging potential. This is a cigar I’d recommend to an experienced cigar enthusiast. This is also a nice cigar for the novice to “graduate” to something in the medium / medium plus range in terms of strength and body. As for myself, not only is this a cigar that I’d smoke and get a box of. It’s a cigar that I’d fight Chuck Norris for.